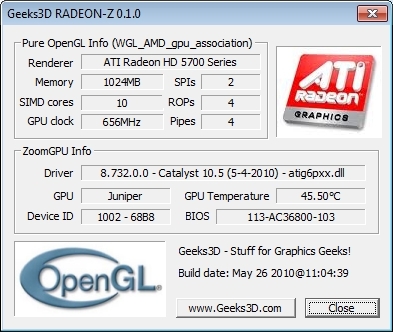 [PROGRAMMING TIPS] How to Know the Graphics Memory Size and Usage In OpenGL. I don’t think this tool will be updated in the future. Maybe, in the best case, its code will be integrated to GPU Caps Viewer. Like GPU-Shark, RADEON-Z does not require installation. Just download the file somewhere and launch it. As its name says it, RADEON-Z works with Radeon-based graphics cards only! I got some bugs with a Mobility Radeon HD3650 256 MB. My GPU frequency is reported to be 50000 Mhz and temperature 0.00°C.